As research into cannabis advances around the world, more and more people are asking what is CBD and what is CBD oil? Cannabis is going through an amazing growth period around the world. As many countries and states around the world move towards the legalization of cannabis for both recreational and medicinal purposes, this growth is fueling research into cannabis for medicinal purposes. For centuries cannabis was used as a medicinal herb, it was back in the early 70’s when the U.S. and other governments around the world reclassified it as a narcotic. Now, research is uncovering that there is much more to cannabis than we ever thought! Cannabis contains compounds known as cannabinoids. These cannabinoids like THC and CBD interact with our endocannabinoid system. The endocannabinoid system is responsible for maintaining balance and harmony in our body, controlling things like emotion, sleep, hunger, and pain relief. The ECS is made up of receptors spread throughout the body, central nervous system, and brain. CBD and other cannabinoids interact with the receptors, bonding with them and creating a chemical reaction. Koi CBD has a complete range of Koi Naturals Full Spectrum CBD oil products. All of Koi CBDs products are made from the highest-quality cannabis and contain a full spectrum of cannabinoids such as CBD, CBG, CBDV, and 13 powerful Terpenes. 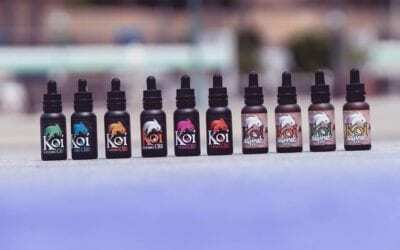 Feel free to check out Koi CBD’s full range of high-quality CBD oils, CBD pet treats, CBD vape oil and CBD gummies. CBD isn’t psychoactive like THC and contains no psychoactive properties; it won’t get you ‘high’ at all. That’s why CBD is completely legal in over 40 countries around the world. CBD is short for cannabidiol and is one of the most common cannabinoids aside from THC. CBD oil is one of the easiest ways for people to experience the potential benefits of CBD. CBD oil can be consumed orally by itself or mixed with food and drinks. Other popular delivery methods include CBD oil being sprayed under the tongue, CBD vape oil to be used in a vaporizer, or applied directly to the skin via cream. CBD oil is made from high-CBD strains of cannabis or hemp which contain low or no amounts of THC. Other medical marijuana products usually contain high amounts of THC. Because all the THC has been removed from CBD oil products, there are no psychoactive properties, and CBD oil won’t get you high. CBD is just one of the cannabinoids found in the cannabis plant. There are over 100 other cannabinoids in cannabis, but the majority are only found in very small amounts. Some of the other popular cannabinoids found in cannabis are CBD, CBG, and CBDV. CBD oil is concentrated CBD and has shown incredible potential as a medication for pain relief, anxiety relief, appetite support, sleep aid and much more. If you have any questions about CBD oil or any of the high-quality CBD products which we stock at Koi CBD, then please don’t hesitate to contact us. Our friendly and professional team are always happy to help. CBD Vape Juice: What is it and why should you try it?